Like a stream of air shooting out of an airplane's broken window to relieve cabin pressure, scientists at Scripps Institution of Oceanography at UC San Diego say lava formations in eastern Oregon are the result of an outpouring of magma forced out of a breach in a massive slab of Earth. Their new mechanism explaining how such a large volume of magma was generated is published in the Feb. 16 issue of the journal Nature. For years scientists who study the processes underlying the planet's shifting tectonic plates and how they shape the planet have debated the origins of sudden, massive eruptions of lava at the planet's surface. In several locations around the world, such "flood basalts" are marked by immense formations of volcanic rock. A famous example is India's Deccan flood basalt, a formation widely viewed as related to the demise of the dinosaurs 65 million years ago. 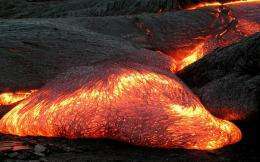 Such eruptions are thought to typically occur when the head of a mantle plume, a mushroom-shaped upwelling of hot rock rising from deep within the earth's interior, reaches the surface. Now Scripps postdoctoral researcher Lijun Liu and geophysics professor Dave Stegman have proposed an alternative origin for the volcanic activity of Oregon's Columbia River flood basalt. Liu and Stegman argue that around 17 million years ago the tectonic plate that was subducting underneath the western United States began ripping apart, leading to massive outpourings of magma. Their proposed model describes a dynamic rupture lasting two million yearsa quick eruption in geological terms across the so-called Farallon slab, where the rupture spread across 900 kilometers (559 miles) along eastern Oregon and northern Nevada. "Only with a break of this scale inside the down-going slab can we reach the present day geometry of mantle we see in the area," said Liu, "and geochemical evidence from the Columbia River lavas can also be explained by our model." "When the slab is first opened there's a little tear, but because of the high pressure underneath, the material is able to force its way through the hole. It's like in the movies when a window breaks in an airplane that is at high altitudesince the cabin is at higher pressure, everything gets sucked out the window," said Stegman, an assistant professor with Scripps' Cecil H. and Ida M. Green Institute of Geophysics and Planetary Physics. Liu and Stegman came upon their new mechanism by attempting to describe how the complicated structure of the earth's mantle under the western U.S. developed during the past 40 million years. The final state of their model's time-evolution matches the present day structure as imaged by the USArray, the National Science Foundation's transportable seismic network of 400 sensor stations leapfrogging across the United States. "This paper highlights the importance of interdisciplinary efforts in Earth sciences," Liu added.